The auto industry model year (MY) runs from August 1 to 31 July, so a 1981 model could have been produced between 1 August 1980 and 31 July 1981. 1976 MY: Production starts for LHD European 924 Nov 1975. Features 2-litre 125bhp, liquid cooled, in-line, 4-cylinder engine. Rear mounted manual 4-speed or option 3-speed automatic gearbox. 1977 MY: RHD deliveries start March 1977. Zinc coating introduced for load bearing and underbody areas only. Limited edition 'Martini' (option M426) model (Grand Prix White with blue/red/white stripes, white alloys, special Martini interiors, dash plaque). 1978 MY: Rear suspension revised with rubber mountings (reducing cabin noise and improving ride quality). Option 5-speed manual (with 'dog-leg' 1st gear) gearbox and electrically operated and heated external mirrors. Entire bodyshell now zinc coated with 6-year warranty against rust perforation. UK 'Lux' option includes alloys, tinted windows, rear wiper and headlamp washers. 1979 MY: 924 Turbo introduced, 170bhp with single turbocharger. Interior ventilation improved with separate fresh air fans. UK 'Lux' option now includes electric mirror and windows. 1980 MY: 924 gets breakerless ignition system, New 5-speed (with 1st/2nd gear in line) gearbox standard. 'Cog wheel' fuel filler replaced by integrated flap in body. Electrically operated driver's mirror standard. Limited edition 924 'Le Mans' (option again M426, 100 cars to UK, Alpine White with red/yellow/black cheat lines on sides, Turbo rear spoiler, sunroof, rear wiper and passenger door mirror, black leather seats w/ white piping, 15-inch multi-spoke alloys). 924 Carrera GT limited edition from June 1980, 210bhp with engine intercooler, polyurethane front wings and rear arch extensions (400 total, 75 UK). 1981 MY: 'Series 2' 924 Turbo with 177bhp, Digital Motor Electronics (DME) ignition and improved turbo oil recirculation. 7 year warranty against rust perforation. All 924s have improved steering column switch gear, new quieter fuel pump. 924 GTS limited edition with 245bhp. All 59 LHD. 1982 MY: Revised interior ventilation allows option air conditioning, 3-spoke steering wheel, better synchromesh, front anti-roll bar standard. 1983 MY: Rear spoiler standard. Reverse gear gets synchromesh. 1984 MY: Electrically tilted sunroof and centre console tailgate release. 1985 MY: Graduated tint windscreen, heated washers. 924 discontinued. 1987 MY: RHD 924S. 150bhp, 2.5-litre M44 alloy engine. 1988 MY: 924S engine uprated to 160bhp. Model discontinued June 1988. The 924 is a gorgeous piece of 1970s automotive art, echoing the evolution from 1960s curves towards the boxy looks of the 1980s. This isn't a fire breathing hot rod that requires you to adapt to its quirks and habits, but is a solidly reliable everyday sports coupé with remarkable versatility. Using many contemporary VW Golf parts with an underlying Porsche design philosophy, the 924 was powered by a mild mannered 2-litre, overhead camshaft engine of Audi heritage. The car's 2 + 2 packaging is clever, with an almost ideal 53% front/47% rear weight distribution, delivering extremely balanced handling. This may not be a car for tall drivers, as the steering wheel is set low and can interfere with long legs. The 924 Turbo upped the maximum power to 170bhp and the all-round specification uplift turned the 924 into a potential 911 beater from a performance viewpoint. The relatively enormous turbo 'throttle lag' is a period bonus. The 924S offered the attractive 'narrow' body with the 944's 2.5-litre, all alloy overhead cam engine, plus most of the 944's improved interior, brakes and suspension. The M44 engine's ultra smooth power delivery and 150/160bhp transformed the driving enjoyment and mark this model out as the range's best for everyday use. The 924 limited editions are very hard to find today, with the GTs coming from a time when Porsche tried to compete at Le Mans with the model. 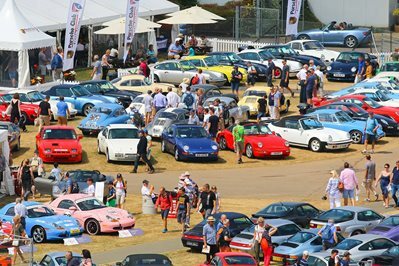 The cars themselves are very well engineered and thoroughly deserve their contemporary acceptance among the Porsche classic collectibles. The first cars (1978-80) are notable for their unspoilered appearance and wild Pasha check interiors. The two-tone paint jobs of 1979 are also very period. These early cars will either come with a fairly unimpressive 4-speed manual or the 'dog-leg' 5-speeder (where first gear is out of the 'H' to the left and back). That wasn't fixed until the Audi 5-speeder of the 1980 models (1st/2nd in line with 5th out to the right). The best 924 buys will be the DME equipped cars as these are more developed (no hot start issues, quieter and with better handling, interiors and optional equipment). The 1983-on models came with the small rear lip spoiler (an option from '82 and can be retrofitted) and the electric tilt sunroof. Air conditioning wasn't generally a feature of any UK 924's spec and the cabin can become a bit stuffy. The tilt sunroof is therefore a good option to have or you'll get used to having the driver's window open a crack most times. The early Martini model frankly doesn't offer much compared to the better equipped later cars and while the 924S 'Le Mans' is very rare, it is the 924S to have. If you are looking for a 924 with attitude, the Turbo is worth a look, with the 'Series 2' cars from the 1981 model year are the best buys (and marginally less likely to cook their turbos). It is a very rapid point to point tourer with better suspension and disc brakes all round. Finding an uncrashed, good condition Carrera GT is very difficult, not least because the polyurethane arches and wings have not aged well on some cars. Proving authenticity is also important on the CGTs. 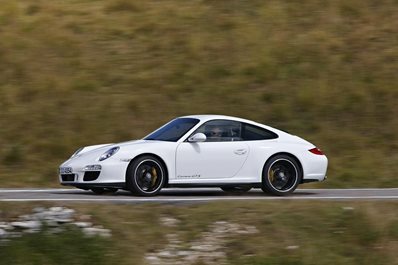 Like the even rarer GTS, these specials usually require expert help to buy. Doing work yourself - like oil and filter changes, brake fluid, plugs and brakes - can save significant amounts on the running costs. A large bill for an engine rebuild or extensive reconstruction and painting can swamp the actual value of the car itself. The 2-litre engine has a good reputation for reliability, but age and poor maintenance will take its toll. The original service interval for the 924 was 6K miles or annually. Modern quality oils have improved the engine protection, but all cars should still have an annual oil change, costing perhaps £120 (inc VAT). Brake fluid should be changed officially every 2 years, but many enthusiasts would probably extend that a year or two. Cost would be around £75-85. The cam belt (£10) should be changed every 30-40K miles or 4 years and doesn't need special tools. A special tool is needed to change the spark plugs as they are located on the exhaust (lower) side of an engine tilted 40 degrees to fit it into the engine bay. The valve guides are mechanically adjusted and on a high mileage engine worn guides will usually blow blue smoke at all speeds. A head rebuild will probably run to £1K-1500 and these days it goes without saying the valves should be able to run on unleaded fuel (the originals were not). The other wear item is a worn camshaft, which will make a noticeable tapping sound from under the cam cover. There's a small oil feed pipe under the cam cover than can fracture and leave the rear cam lobes without oil. This can quickly lead to noisy cam operation. A replacement camshaft costs around £600, so identifying wear here is important. Worn engine mountings show themselves as additional vibration. Replacements cost around £90 and can transform the cabin environment. Clutch life is difficult to predict, but if this is slipping on acceleration, expect a £5-600 bill. On a 924 the front discs/pads should last at least 25K miles. Replacement cost will be about £400. The rear drum linings are not visible, but the VOSA test will usually show up braking inefficiency. The 924 Turbo and 924S will use up their brakes more rapidly. A suspension overhaul can transform the ride and handling and should be possible for under £1K. The most fragile unique component of the Turbo is the turbocharger itself. Unfortunately, there is no turbo cooling system after shutdown (unlike the 944 version) and turbos can run their bearings because the oil protecting them overheats. A cared for turbo may only last around 50K miles. Replacement can cost £1500. A worn turbo will show itself by the trail of blue smoke behind the car, particularly at higher RPM. Age related issues include a corroded or previously crashed bodyshell. The large 7mm panel gaps that adorn the 924 were very old fashioned even in the 1970s, but today, inequalities in those gaps can be a useful indicator of bodyshell repairs. Look for poorly matched paint and poor panel gaps (especially at the front). Sills and rear suspension front mounts should be properly weld repaired and protected. Ask the seller if you can jack up the car (safely, and using axle stands) to look underneath for corrosion signs, oil leaks and worn or corroded brake lines and suspension parts. The exhaust is a fairly simple structure in 3 parts. It's usually the middle box (around £45) or the rear tailpipe that goes with the latter costing around £200. Check out the engine when cold and when idling and warm. Any substantial ticking or clicking noises should be considered with caution and smoke from the exhaust is considered above. On a car that is 30+ years old basic items like the plug leads can break down over time and most cars today will have these items replaced. There shouldn't be a hot start problem with an early 924 these days, but any other running issues with the K-Jetronic fuel injection will usually need an expert to fix. The same applies with any gear selection issues. The most frequently noted issue with the transmission is worn propshaft or differential bearings. These show as a whine when driving. A clonking nose or front wheel shake when driving can suggest worn suspension bushes (either lower control arm or anti-roll bar droplinks) - but could just be old or worn tyres. Floaty handling can suggest worn out shock absorbers (which may be leaking). The alloys should be damage free and it’s worth looking carefully for damage repairs or cracked rims. The interior can be prone to wear and this can be made worse by a leaking sunroof or tailgate. Feel the carpets for wetness or crustiness and lift the rear compartment carpets out completely to check the rear wells for corrosion. A cared for car will have its fifth wheel and a toolkit in place here. With the 924S, always check the condition of the oil and coolant for signs of head gasket problems, as well as cam/balance shaft belt life remaining (see the 944 buyers' guide). Always try to drive the car before you buy. Important issues will show up even in a short drive (5 miles would be typical). If you don't have the experience to check the car out yourself, get a pre-purchase inspection expert to look at the car. They will advise on all aspects of the car's condition, what needs replacing now and in the short term and whether the car is valued correctly. Last minute BH Monday Wales driveout..